School madness is in full swing for us and this year we have more extra-curriculars on the schedule than ever before. My son is in his fourth season of soccer and he is trying his hand at hip-hop dance for the first time. My daughter just started ballet too, so on three evenings during the week and Saturday mornings we are booked for the next two months. That being said, you should know that I prefer to cook fresh veggies whenever possible, but I always have bags of frozen goodies in the freezer for extra busy school nights or nights when I'm feeling a bit lazy (yeps, totally happens). If you ask me, I'll tell you that I think a self-steaming, microwavable bag of peas (or whatever veggie floats your boat) is truly one of the best inventions since sliced bread! So, the other day when we were at the store, I had my son go pick out some bags of frozen vegetables to restock our freezer and he accidentally picked up frozen okra. I initially told him to go put it back, but then changed my mind and decided we would just keep it. Variety is the spice of life after all, right?! Okra is one of those ingredients that is pretty specialized in my head and I never really buy it unless I'm planning to make a classic gumbo or another tomato-based goulash I grew up eating. I know all things need to be kept in moderation, but if you tell me you deep-fried anything in my honor, you will have made my day better. However, since we have been consciously trying to eat heathier (and avoid huge messes in the kitchen!) we don't fry too many things on a regular basis. But, frying my accidental okra slices was just what had to happen. I was honestly dreaming about it the night before I made it. The craving was real. Just so you know, the okra that's pictured here is batch number two. I couldn't keep the first batch around long enough for a photo shoot. It was literally disappearing by the handful. So, I sent Evan back to the store to get more okra just for this post. After I made this batch, the only complaint was that everybody had to wait for the sun to get into right position so I could take pictures before they could dig in! Yes, that is a true story. We'll be keeping frozen okra around more often so we can have an occasional batch of this crispy-fried treat. **tip: If you are using previously frozen okra like I did, allow the okra to drain/dry for a few minutes on a bed of paper towels after it's thawed. This will help get rid of some of the extra moisture and breading will stick on a bit better. 1. Mix the cornmeal, flour and seasoned salt together in medium-size bowl and set it aside. Next, in another small bowl mix the water into the beaten eggs and set it aside. 2. Pour the oil into a cast iron skillet or a deep skillet and heat the oil to 350 degrees. 3. Add the okra slices, 1/2 cup at a time to egg wash and then to the cornmeal mixture. 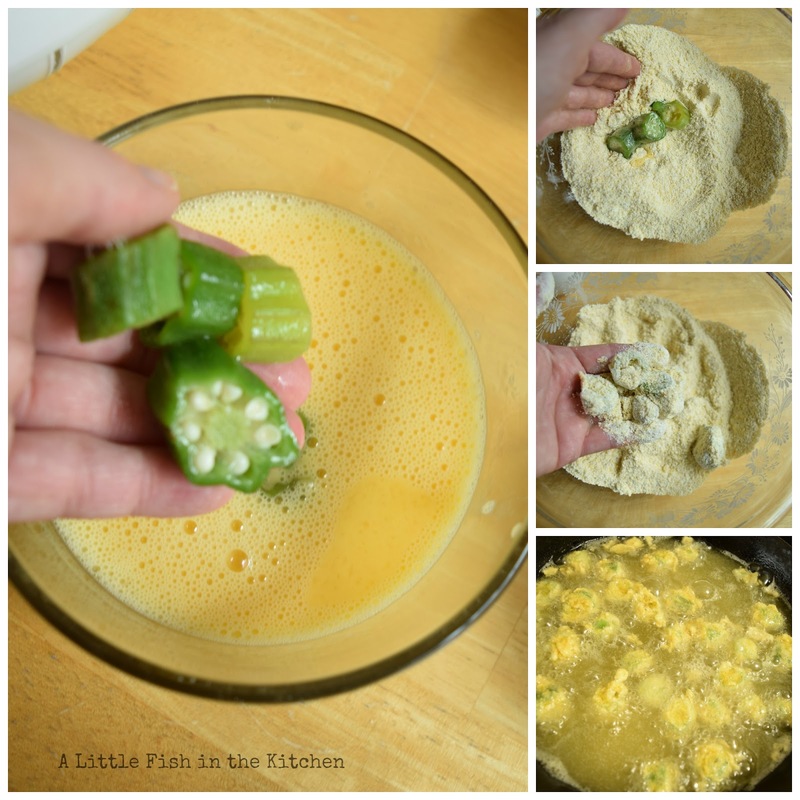 Using your hands, coat the slices well and carefully add the okra pieces to the hot oil. Gently flip the okra pieces in the oil using a spatula or slotted spoon so that they brown evenly. 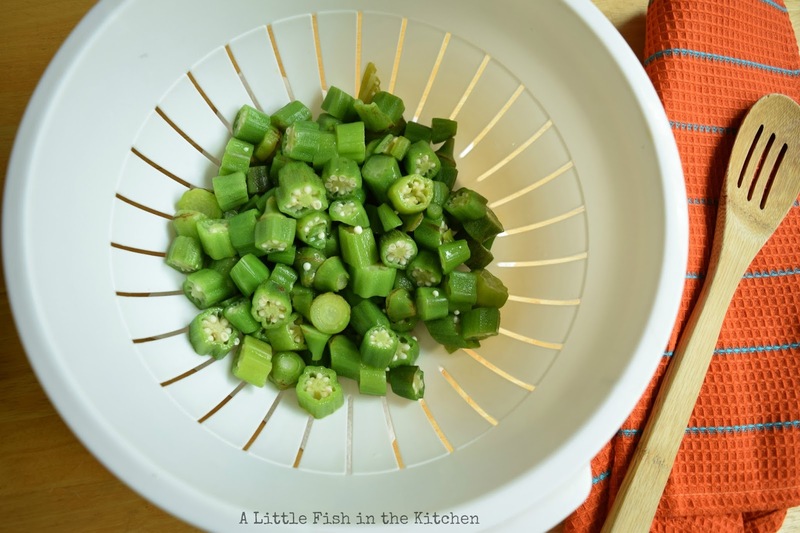 Once the okra slices are golden brown, remove with a slotted spoon and drain on paper towels. 4. Serve with some creamy ranch dressing or cream gravy and enjoy! Crispy fried okra is traditional Southern side dish that is perfect with a barbecue supper or fried chicken dinner. Or, you can just eat it like a snack with ranch dressing like we do! If you are using previously frozen okra like I did, allow the okra to drain/dry for a few minutes on a bed of paper towels after it's thawed. This will help get rid of some of the extra moisture and breading will stick on a bit better. 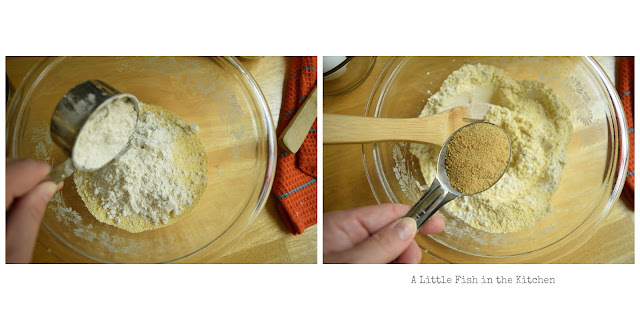 Mix the cornmeal, flour and seasoned salt together in medium-size bowl and set it aside. 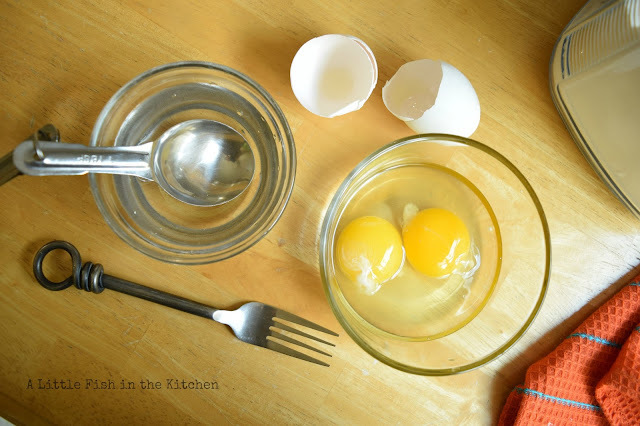 Next, in another small bowl mix the water into the beaten eggs and set it aside. Pour the oil into a cast iron skillet or a deep skillet and heat the oil to 350 degrees. Add the okra slices, 1/2 cup at a time to egg wash and then to the cornmeal mixture. Using your hands, coat the slices well and carefully add the okra pieces to the hot oil. Gently flip the okra pieces in the oil using a spatula or slotted spoon so that they brown evenly. Once the okra slices are golden brown, remove with a slotted spoon and drain on paper towels. Serve with some creamy ranch dressing or cream gravy and enjoy! Okra is a love or hate vegetable. I love okra two ways fried and pickled. Your fried okra looks delicious! I can see why it was gone so fast. 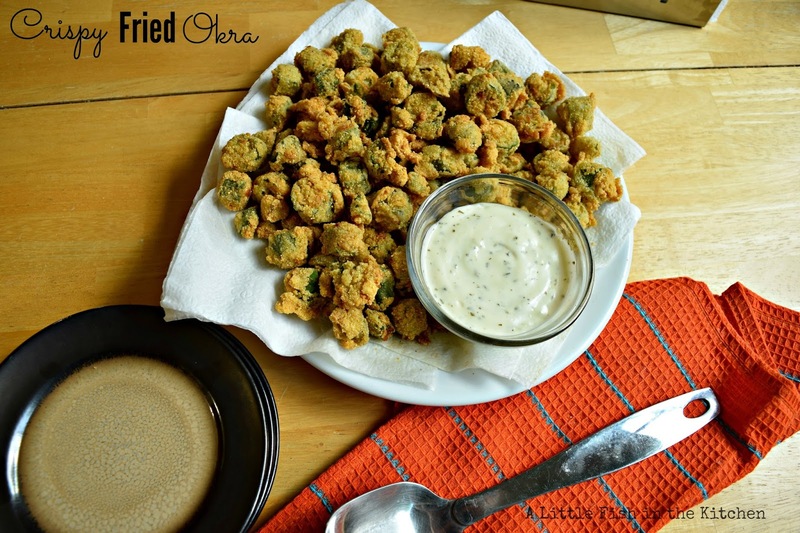 It has been years since I last did some frying...these crisp okra bites look so tempting! this is fantastic! i have NEVER bought frozen okra for the very reasons you listed! excellent way to roll with the punches--i'm not surprised it disappeared in a flash! Wow - that's one popular recipe! I'm glad it went over so well. This sounds like a wonderful treat!! No wonder it disappeared so quickly!!! 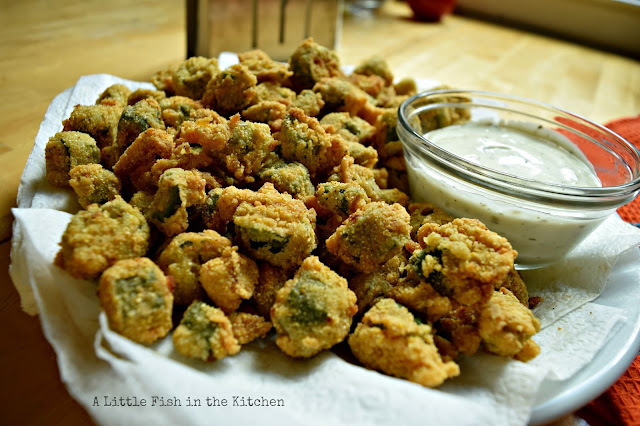 The only fried okra I have had was in NOLA and yours looks a hundred times better! Wow, David! Thank you so much! Love fried orka! Don't have it often (the frying mess and all), but it's such good stuff. Yours looks terrific -- thanks. Hi John! It was a nice change of pace for us, thank you!